New Vinyl reissue of this classic Behrman work from 1977. 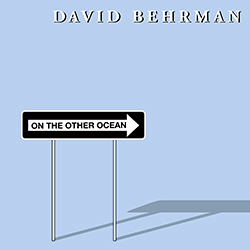 "It is the David Behrman album that I have been playing most often lately, however. I have been fond of Behrman's music for some time, and these two sides seem to put it all together. The music is extremely sophisticated, yet extremely simple; totaly committed to technology, and yet totally human, highly abstract, yet highly emotional. It combines the best of a number of worlds, and if any of the lovely records are still in print 20 years from now, I have the feeling it will be this one. Side one, "On the Other Ocean," drifts placidly on six pitches. Arthur Stidfole plays lush, sustained bassoon tones, Maggi Payne adds slow flute lines of great warmth, and a microcomputer, Kim-1, provides sustained electronic tones that respond automatically to the instrumentalists. Side two, "Figure in a Clearing," moves somewhat more erratically on its six pitches. Here, David Gibson manages to make his cello tones blend miraculously with the triangle waves of the computer's response, and man and machine seem finally and irrevocably joinded. Behrman's sophistication is most apparent in the way the tonal center gradually drifts around. To my ears, the first side, for example, gradually moved from G to F, back to G, and on to D, with a number of little side trips along the way. Much of this gradual modulating seems to come about without actually changing the pitches much, but rather ghrough subtle alternations in the volume of the electronic tones in the background. Meanwhile, both sides convey a quality that I can only describe by tha currently unfashionable word, love."